FLUSH MOUNT PHOTO ALBUM from MyPhotoCreations! Two available plus 6 other prizes! HURRY! Ends 11:59pm CST Monday, November 29, 2010! Please note, if you’re looking for a review of BrideBox’s flush mount, you’re in the right place. BrideBox and MyPhotoCreations are “sister companies” and therefore the products are the same, as is the software you would use to create it. The folks at MyPhotoCreations contacted me to see if I’d like to check out their newly launched consumer site, that just went live about a month ago. After taking a look at the unique lineup of flush mount albums and photo books on their site, I was definitely interested in checking them out. Although it may be a new name in photo book printing, the company behind it isn’t. MyPhotoCreations is brought to you by the same folks behind DigiLabs, a name familiar to professional photographers since 1997. MyPhotoCreations represents the recognition of a growing consumer market for high quality photo albums and books. Since I’d never tried a flush mount album before, I was very much interested in trying out the Anza to see how it compared to the other lay flat photo books I’d tried before. MyPhotoCreations software is both Mac and PC compatible and is downloaded to your desktop. What’s interesting about the book design program is you can opt to buy the software in order to print your creations from your own home printer for $39.99. There is also an option to buy the software ($399.99) for commercial use, so that may be of particular interest to pro photographers. Another interesting feature is that the software is available in several languages. Unsurprisingly, I have been running out of internal hard drive space, so I liked that I was able to download and run the software from my external hard drive without a problem. After you download the software, you choose the type of book you want to make. A screenshot of the book designer. The coordinates, measurements and resolution of the individual photo boxes and elements are instantly visible at the bottom of the workspace when you hover over each element. I don’t think I’ve ever seen design software which tells you the resolution of your photos and in such a convenient way. According to the company, you can probably get away with as low as 150dpi, and somewhere between that and 300dpi is better. For more on dpi and resolution check out my post. The software was very easy to use and I finished my Anza relatively quickly in one evening! It doesn’t appear that you can add any title to the Anza books. The cover layout was locked so I’m pretty sure I didn’t miss the option. Here’s a screenshot of the Anza book specs. All of MyPhotoCreations’ photo books are in my searchable database as well. 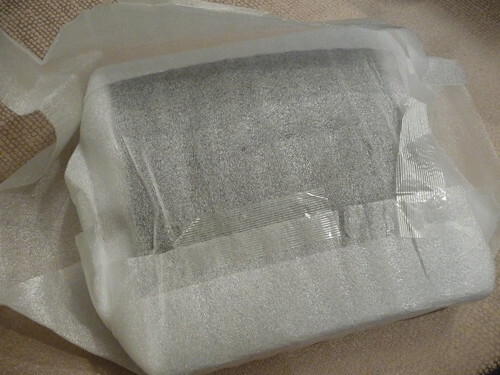 The book comes wrapped in two layers of cushioned wrap. And encased in a black presentation box. Ta-da! Finally got to the book! The Anza has a genuine leather cover. The spine of the Anza can’t be titled. 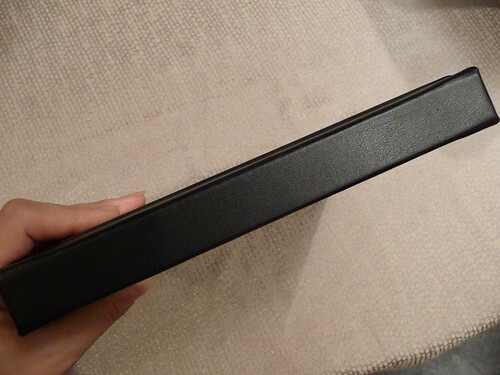 I found the book very well constructed – it feels very luxe and sleek. 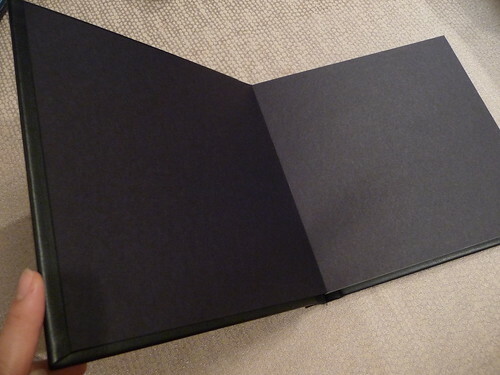 The inside cover of the photo album. The opening page of my wedding flush mount album. You can see how crisp and clear the printing is. The image pops. 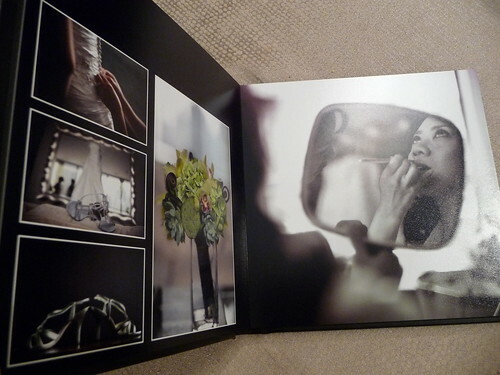 PHOTOBOOKGIRL’S TIP FOR BRIDES AND GROOMS: I like to incorporate other elements besides my photos in my photobooks. You may have seen me scan my ticket stubs, maps, postcards etc. 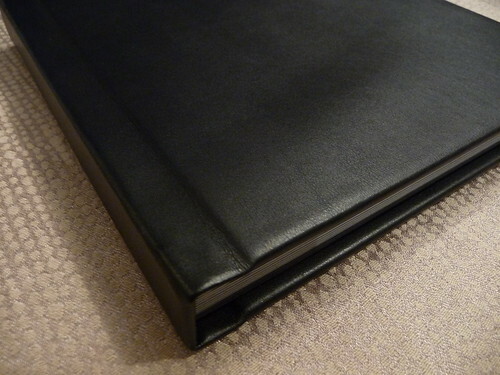 to add a scrapbook style element into my photo books. A perfect example of that here is the image of the front and back of my wedding invitation. This does a perfect job of “captioning” my book – it gives all the particulars of our big day all in a neat package! Try it! The pages are printed on real high quality photo paper and then mounted onto a hard board surface. The pages are super-thick and unbendable. Notice the sheen of a real photographic print. There is a gutter, but it’s tiny! Didn’t have time to set up a good lighting situation – the point is to show you how small the gutter is. Side view of the lay flat binding and gutter. The Anza is a beautiful book. The print quality is excellent and the images are crisp, vibrant and have depth. The software was very easy to use and it was a quick start to begin designing my pages. 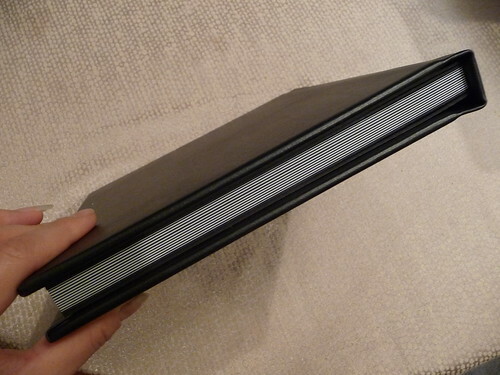 In terms of cost, it’s definitely an expensive book, but it is a high end album and you can’t really compare a flush mount album with a standard photo book. I actually think paying $50.00 more for the larger 10×10 would be worth it to get more of an impact. You may already know how I love getting a deal (who doesn’t?) so if you’re planning on making an album with MyPhotoCreations – I have a great special coupon code for Photobookgirl readers! Get 30% 20% off all MyPhotoCreations albums – (the Anza or the Marina)! The 8×8 Anza like mine is normally $249.99 but with the 30% off is $175.00. The 10×10 normally $299.99 at 30% off is $210.00. At that price, I say go for the 10×10! Hmm…so am I completely done making wedding photo books yet? I can’t promise! But we may be due for a wedding book comparison post very soon! Happy Thanksgiving and don’t forget to enter the MyPhotoCreations Giveaway! This album looks great! I notice you most often pick black as your background, do you do that to match with your other albums? I’m just curious to know :), love reading your blogs! Look forward to the next one! I like neutrals like black cause they allow your photos to stand out. I also like using other photos as background if I can find one that works well and is complementary to the photos in the layout. Looks very nice! I’m wondering about the photopaper they use. How does it compare to Adoramapix paper? Is it similar or a higher quality? Good question Sharon – they are both printed on photo paper, but the finish is different. I would say MyPhotoCreations looks more like a quality photo print, but a big part of that is the hard board that it’s mounted on. I am planning to do a post comparing and contrasting all the companies that I’ve printed wedding photo books with so stay tuned! I love the almost gutterless look. Hope I can win one!! Great post! I love all the photos and your detailed description! I would like to know how it compares to AdoramaPix as well, thx! This album is beautiful! Love the flush mount. I love the black!!! It’s perfect. I WANT ONE!!! What a beautiful album! I love your photos and layouts too! I like the black background you used on this photo album. Do you use any other color for your backgrounds? 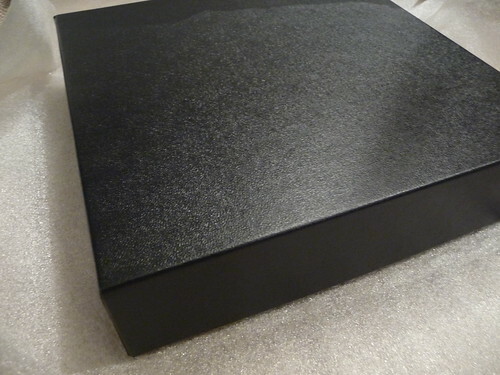 When I make my photo book, I’m going to take your advice and order the 10 x 10! This looks like an easy program to follow and I like that you can boost the color in just one click by hitting “perfectly clear”. Please make sure to come back and let us know how you liked it! I actually ended up going with the Picaboo flushmount album because I decided I really wanted gilded page edges and a white leather album which the Anza, unfortunately, doesn’t have the options of. Picaboo is a bit pricier but it really is also a high quality and gorgeous flushmount diy album! It was through this post that I got the inspiration to create my own Anza photo book. I am so glad that I stumbled upon your site! Thanks for sharing all that you do! I’m so excited that flush mounts are starting to become direct to consumer! I might hold out a few more years, but the one you made looks great! I made an Anza Flush Mount wedding album and it turned out fabulous! It is so impressive. Your review was right on. The packing and the cover are just beautiful and that’s just the outside. The software was easy to work with. I am excited too that flush mounts are becoming more available. I am in the process of converting my film negatives to digital files and I’d love to do another album. I love your site-I am putting together a wedding photo book for my husband and myself, and I think this is the book I have been looking for! Does your coupon code still work? Thanks! On their website, they offer Anza and Marina, what is the difference? I believe it’s the additional cover options and additional pages that can be added in the Marina which makes it cost more. I don’t believe the interior pages are different. Did you ever contact the company to see if they could work out another coupon deal? I’m between them and Picaboo but love the look of your album so I would like to do the Anza or Marina. Love your work, keep it up for the rest of us! Thank you for this blog!! I am in love with my wedding photos but am unfortunately taken aback by the price my photographer is charging for an album ($1000+)!!! 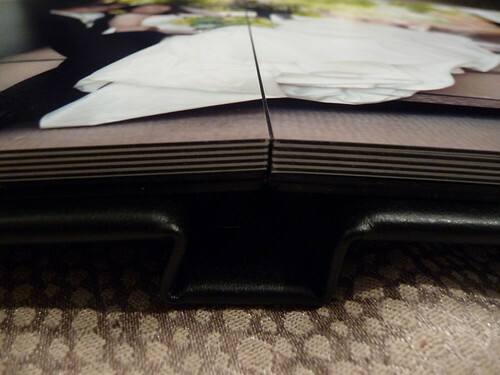 I typically scrapbook for a hobby but of course for my wedding album I want a sophisticated, classic flush mount album. To the other users out there, who did you go with? Picaboo or Myphotocreations? I’m reading great reviews on both and cannot truly catch any differences. Thanks! Do you have any current coupons for BrideBox or MyPhotoCreations? Not right now, but if there are any deals they would show up here (see link). Also, you can click on the logo to go to the site and if they have any deals there, it will show up. http://www.photobookgirl.com/BrideBox-reviews/ If you’re looking for flush mounts you can also check out AdoramaPix. I will be reviewing their flush mounts soon! http://www.photobookgirl.com/AdoramaPix-reviews/ Best!